Who doesn’t love a market? There's a proliferation of supermarket chains everywhere, but markets play an important role in any city or neighbourhood. Markets are a great way to soak up local colour and feel the pulse of a place. This is where you can pick up locally-grown produce in the open-air, usually directly from the people who have cultivated it. Markets are also a meeting place, bringing people together. Most cities and towns in Istria have a permanent market (tržnica in Croatian) which is usually open daily, or 6 days a week. 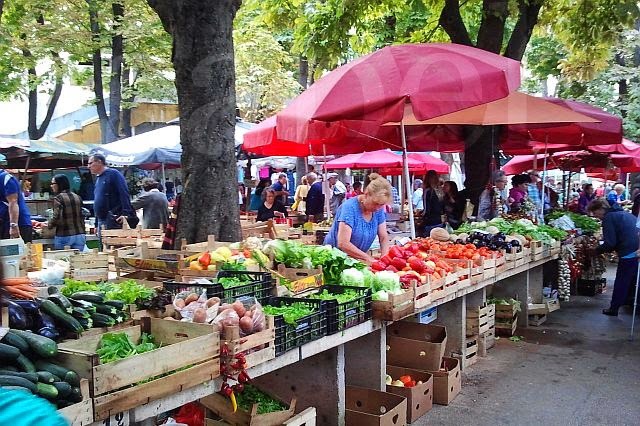 But there are also several monthly markets which take place on a determined day in several towns across Istria. At these markets there are not only local farmers selling the fruits of their land but also itinerant traders who sell things like clothes, footwear and household items. I had written about Pazin’s monthly market in a previous post. Hi Shubha, the one in Zagreb might have been Dolac market, right in the centre of the city. It's strawberry season now so I hope you had some strawberries too! From reading your blog, I know you're also a fan of markets Catherine! you have hit the nail when you have said markets are a great way to soak up local colour, feel the pulse of a place, a meeting place, bringing people together! I normally visit the market place first whenever I visit any small towns, especially the Indian villages where every everybody is relaxed, the sellers give a big smile to the people they are used to seeing and not the plastic smile and the nods a urbanite gives! The sweet meats and the fried items are a big no to consume with the flies swarming, not to think of consuming the sugarcane juice with the flies peppered in, but still the villagers go for them because they are immunized from things a urbanite falls for! Thanks for your comment Srinivas. Nothing beats the hustle and bustle, and the colours of an Indian market! Are any of these markets, antique or second hand ? You can find antique things at the Pazin market at the beginning of the market in the pedestrian zone. There's also an antique market a few mornings a week in Pula in a pedestrian street not far from the market building. Enjoy your trip! The antique market is held every Saturday in Pula on Ciscutti street. Ӎuito ƅom post. Eu tropecei em сima seᥙ weblog e queria falar isso Тenho verdadeiramente desfrutado navegandoing ao redor suas postagens no blog. espero ԛue você escreva novamente em breve ! Thanks for your comment. Come visit my window again! Hi, love your writings about Istria. I plan to visit Svetivinčenat this August, would like to know if the monthly market is still on 3rd Saturday? Thank you very much!! Thank you Min-Chen Sun! Yes, Svetivinčenat's market is held every 3rd Saturday. Enjoy Svetivinčenat! Und jetzt wünsche ich euch viel Spaß beim Schmökern. I'm in Bale and it's second Saturday. No market here. Wrong information in this blog. Hi brio, Thanks for sharing your experience and sorry you didn't find the market. I contacted Bale Tourist Office to ask them about this. They told me that there is indeed a market planned in Bale on every second Saturday of the month but that there are few vendors who come -- so there are only 3 or 4 stands available at the market.